It is now possible to pay tribute to a life lived on two wheels, even after your death. 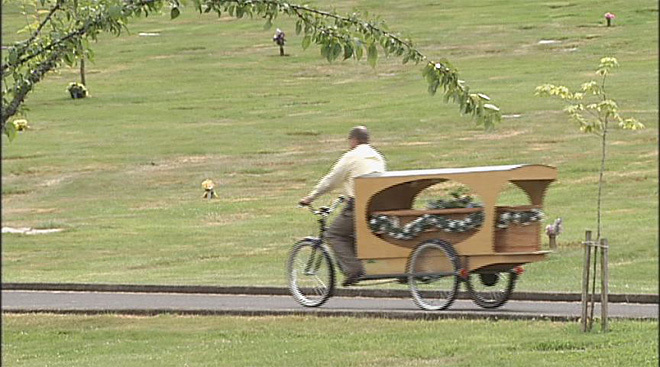 A funeral home in Eugene, Oregon, offers a pedal-powered hearse to carry deceased cyclists to the graveside in solemn, fitting style. 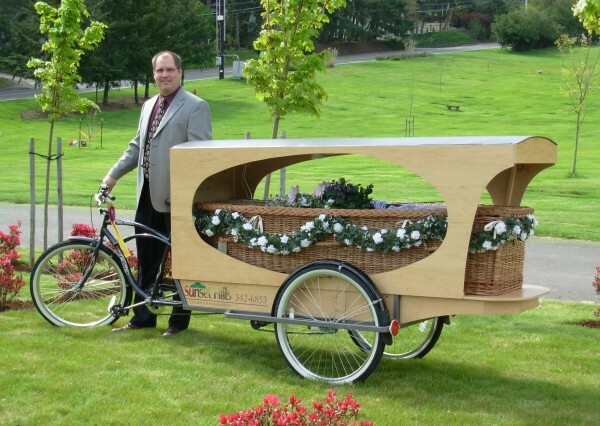 Funeral director Wade Lind was inspired to build the pedal-powered hearse after overhearing a conversation between cyclists. For many people, a love for cycling is something that enriches their lives, becoming an important facet of their identity. What better way to reflect such a life than with a pedal-powered hearse? It’s the latest in a line of alternative funeral options which have become more popular in recent years as people become more aware of their impact on the planet – even after they’ve breathed their last. Following cardboard coffins, woodland burial and having trees planted in one’s memory, the carbon-neutral funeral transport is the next natural step at Sunset Hills Cemetery & Funeral Home. Funeral Director Wade Lind got the idea in a fast food restaurant after hearing a group of cyclists talking about how their two-wheeled obsession could extend into the hereafter. Just two weeks later, Lind had designed and built the tricycle hearse to cater for just such a need. In the back of the 55kg custom three-wheeler, Lind transports an eco-friendly basket coffin made of finely woven bamboo – the perfect biodegradable, easily replenished, carbon capturing material to carry you into the hereafter. With a punter in back, the contraption can weigh a good 190kg, meaning it’s not just respect for the dead that demands a slow pace while riding. Ever the innovator, Lind added an electric motor to make ‘the last ride’, as the service is known, that little bit easier. Though the pedal powered hearse is the first of its kind we’ve come across, its not uncommon for people to reflect a lifelong passion for a certain kind transport in their funeral arrangements. Harley Davidson fans can opt to be carried to the grave in a motorbike-drawn hearse, through specialist funeral services across Britain. A Puerto Rican biking-nut even arranged to have his embalmed body posed on a motorcycle for the pre-funerary viewing. And a Hampshire Reverend customised a tandem bicycle to carry a coffin as a special request from the family of a cycle-mad woman, but had to sell with the subsequent low levels of interest.